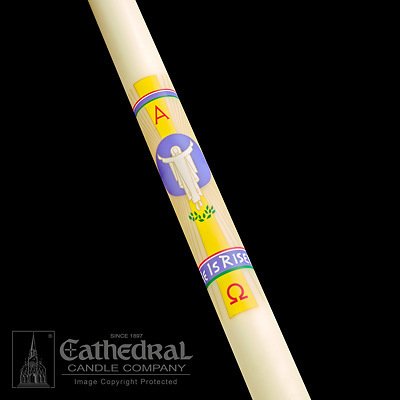 Cathedral He is Risen Paschal Candle 2-1/16" - 36"
Cathedral's SCULPTWAX candles are 51% beeswax and are skillfully decorated with hand-cast, color infused wax. The beautifully detailed appliques created a striking and unrivaled, three-dimensional relief. Includes a set of five wax nails with embedded incense and year dates. Made in the USA. Select size needed from the drop down menu. If unsure of candle size needed please click the Size Chart button under the image.